David Hanson’s plays have been called experimental theater and high-concept art. He prefers “immersive theater,” citing his current production, Audience, as an example. Immersive theater covers a fairly broad range, Hanson notes. He says murder mystery theater, in which the audience plays some part, is immersive, as is Natasha, Pierre, & the Great Comet of 1812, now on Broadway. 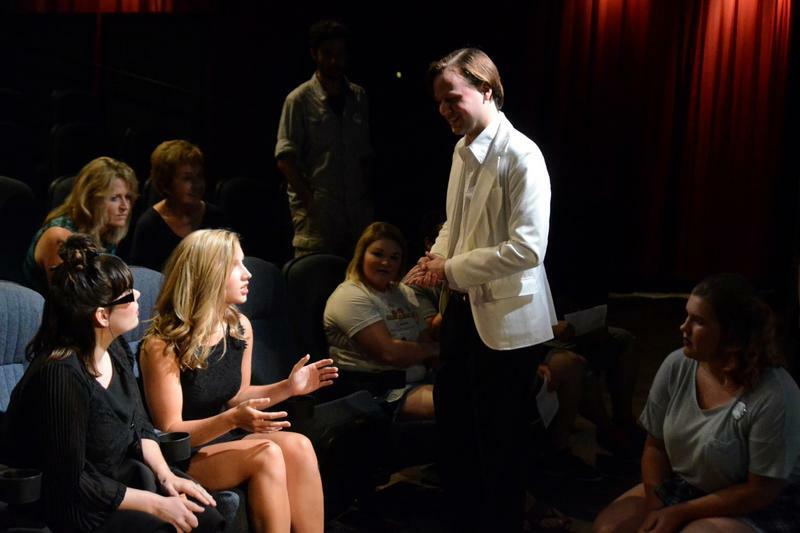 Audience, which was first produced at the 2016 Kansas City Fringe Festival, consists of four one-act plays, each performed by two actors, plus two “ushers.” The audience is seated on the stage, with the actors where the audience normally would be. The four duets are performed simultaneously. The pairs of actors — some of the characters know each other, some are strangers and must figure out why they’re together — are all dead. They must process the lives they’ve lived and their ends. The driving conflict is that they must agree to move on — a huge point of contention between them. Hanson knows the idea sounds overwhelming. So before each show, he tells the audience he understands if someone needs to step out. So far that hasn’t happened. As the four sets of actors speak among themselves, the audience is free to move from one to the next, or stay in one spot and attempt to hear it all. (Hanson warns that though viewers may move and speak to each other during the performance, Audience is not interactive — that is, the theater’s “fourth wall” must remain intact and viewers may not talk to or touch the actors.) He says the only negative critique he’s received is that some people don’t like missing bits of the conversations. He tries to address that concern in his upcoming show. The piece lasts only 25 minutes, so he’s offering viewers the option of attending two performances on the same evening — though the script will remain the same, he guarantees each performance will offer a unique experience. Hanson, who by day is the assistant director of Kansas City, Kansas public libraries, says he’s grateful to Cheryl Kimmi, Fringe Festival KC's executive producer. “I don’t think a lot of this stuff happens without her in Kansas City because there aren’t that many people interested in the crazy stuff that we do,” Hanson says. But people are interested, which is why Hanson has been able to take the play into a second production. It’s especially resonating with younger audiences, he says, speculating that is because they’re used to multiple inputs. The cast at Fringe drew from a group called Negative Space, a high school production company. The current cast is older and includes only one high school student. Hanson says he has no problem attracting good actors. In fact, it’s almost as if he’s cast the audience in that supporting role. So far, however, there’s no theatrical term for a production in which the audience is as fun for the playwright to watch as the actors. Fringe Presents: Audience, March 3-4 and 10-11 at the H&R Block Stage at Union Station, 30 W. Pershing Road, Kansas City, Missouri, 64108. Tickets are $15 for one performance or $25 for two performances, with a reception between the shows. Anne Kniggendorf’s writing appears regularly in The Kansas City Star and Ink magazine. Follow her on Twitter, @annekniggendorf.